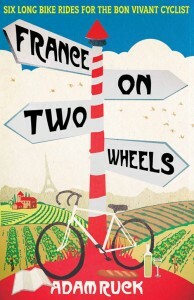 I have been having a great time with my latest read France on Two Wheels: Six Long Bike Rides for the Bon Vivant Cyclist by Adam Ruck. Every evening when I climb into bed Adam is waiting to take me on an adventure – in France, on a bike. I met Adam on Twitter just before Christmas and my first reaction to the write up of his book was “Ooh – look at this! A book about cycling and France and food/wine too. Does it get any better than this?” Well, having read the book I can tell you, yes it does. Adam’s book, like so many other good books on travelling in France that I have read (and I have read a lot), inspires me to get out and see more of France. However, for me at least, Adam brought an extra element of excitement as his ‘way’ makes the adventure seem really do-able. Each of his six routes is covered in about eight days and his daily distance of about 100km would be achievable by us (with a bit of effort put in beforehand). His bike isn’t weighed down with tent and sleeping bag as with a bit of careful planning he finds good value hotels each night – much like we do for our road trips in the Mini. I admire (almost to the point of jealousy) those who can take off with all they need for the next six weeks strapped to their bike. However they all have stories to tell of nights of little or no sleep under canvass for all sorts of reasons and they have made me realise it’s not for me. I don’t do sleepless nights and I know I couldn’t cycle all day following a sleepless night. Adam has made it seem OK to have a cycling adventure and stay in a bed each night with access to a private shower with hot water on arrival and before you leave. Thanks Adam. Add to this Adam’s experience of travelling and writing about France for the Holiday Which? guides for many years and you have a great read with lots of interesting information, including places to stay and eat, along the way. Adam is also the only other person I have ever encountered who has mentioned travelling with The Red Book (France 2012 MICHELIN Guide (Michelin Guides) ) , just like we do. I would be interested to know do you travel with yours? 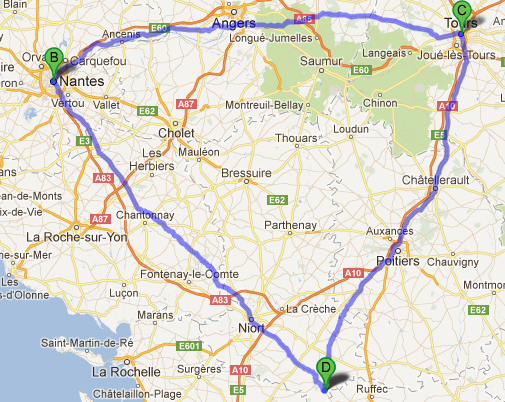 The one downside, as far as Ade is concerned is that he now has a bouncy, excitable wife nagging him about how fantastic it would be to cycle the 600km triangle from home to Nantes to Tours (via the rivers and chateaux of the Loire) to home again, this summer. Adam, thanks for sending me the book and if you are ever planning another cycling trip in France and you need a ‘Girl-Friday’ I’m your man! You can see more on Adam’s adventures, including photos at http://www.france2wheels.com France on Two Wheels is published by Short Books Ltd and is available in paperback and ebook format from all good booksellers and online. Here is the Amazon link. Thanks - I'm delighted to have given you so much pleasure in bed. Thanks Adam, the good thing about road trips by car is that we can keep The Red Book in the glove box! This sounds like a book my husband and I would enjoy. We did a bike trip in Provence -- Avignon to Aix with stops in Nimes, Arles, etc... We stayed in hotels, but we went even wilder by not booking our hotels ahead of time. We'd simply wheel into town and head to the tourism office. We count this as our favorite vacation. I wish I could get the Kindle version in the US, but I couldn't find it on Amazon. Thanks for explaining that Adam, I can see a US Kindle version priced in $, but when I send Paulita the link it is only there in paperback! yap.... I'm interested in your book - France on Two Wheels. A truly good book teaches me better than to read it. I must soon lay it down, and commence living on its hint. What I began by reading, I must finish by acting.